Jena // "When I arrived in Jena, I found everything to be in chaos... "
Luther entered the city of Jena for the first time on March 3, 1522 – disguised as Knight George. He was still living in the Wartburg Castle at this time but had a secret mission to take care of in Wittenberg. He stopped over incognito at the “Schwarzen Bären” (“Black Bear”) in Jena. 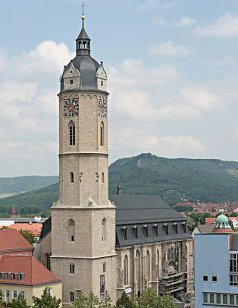 In 1524, Luther took Karlstadt to task in the packed city church. His once close comrade, originally known as Andreas Bodenstein, let himself get drawn into violent attacks against monasteries and cloisters. Luther’s sermon on this day, however, wasn’t able to prevent further escalations. The city church in Jena is home to the original gravestone slab of Martin Luther. It was originally intended for his grave in Wittenberg and can be found opposite the pulpit, from which Luther preached many times. In 1549, the Wittenberg University’s library was transferred to Jena and brought along with it priceless prints from the Reformation era. Among the treasures are Luther’s personal copies of the Old and New Testaments with handwritten marginal notes. They still survive to this day. 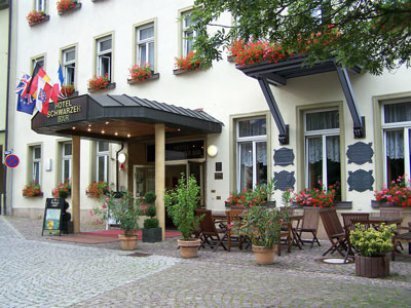 Luther stayed in the hotel, “Schwarzer Bär” many times during his trips to Jena. The painting in the foyer of the hotel as well as a metal plaque on the building serve as reminders of this fact. 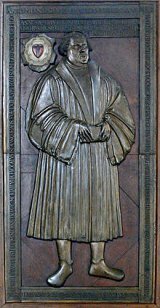 Martin Luther spent time in Jena on numerous occasions between 1522 and 1527. He preached in the city church of St. Michael and participated in disputations with the Reformers Andreas Karlstadt and Ulrich Zwingli. 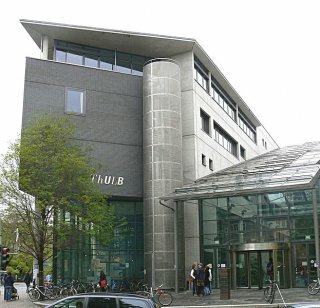 Jena is also known as one of the most important publishing locations for the Luther Bible, edited by one of Luther’s students, Georg Rörer, starting in 1533. The university itself is a result of the Reformation. It was founded in 1548 for the Thuringian region, which was separated from the Electoral Saxony after the Protestant defeat in the Schmalkaldic War. 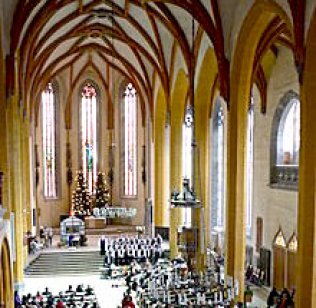 In Jena, the Reformation became a milestone in its historical development. The Great Reformer not only spent many days and nights in the little city on the Saale river, but with the founding of the university Jena became the “site of true Lutheranism.” Why Luther’s original tombstone slab became a well-kept treasure of the city church is something you will experience on this guided tour. as well as the occurrences around Martin Luther in Jena. At the same time her guests see still existing historical treasures and locations from the early 16th century.